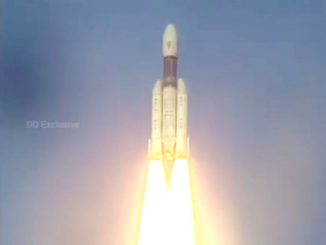 India’s new GSLV Mk.3 launcher delivered to orbit the GSAT 19 communications satellite Monday, and these photos show the rocket lifting off from a launch pad on the eastern Indian coastline powered by two side-mounted solid rocket boosters. 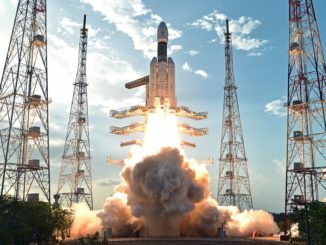 India’s GSLV Mk.3 rocket took off Monday on its first full-scale orbital test flight, delivering the GSAT 19 communications satellite to an on-target orbit after successfully demonstrating new solid rocket boosters, a twin-engine core stage and an upgraded cryogenic upper stage engine. 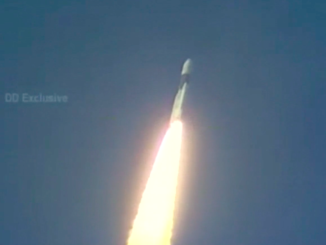 A powerful new launch vehicle climbed into space from India’s east coast Monday, delivering a multi-beam communications satellite to orbit on its first full-up test flight, setting marks for the heaviest rocket and spacecraft ever launched from India. The most powerful rocket ever built by India, boosted by two solid-fueled strap-on motors, a twin-engine core and a cryogenic upper stage, lifted off Monday to prove it can haul satellites into orbit nearly twice as heavy as India’s existing launchers. Launch occurred at 1158 GMT (7:58 a.m. EDT).